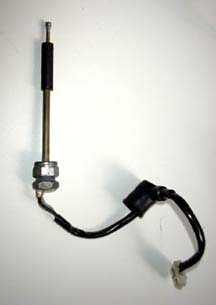 Curing Fuel Sensor Problems by Andy "Skipper"
Now take 12” length of automotive wire (thin enough to fit trough the brass tube) and strip about a quarter inch of insulation. 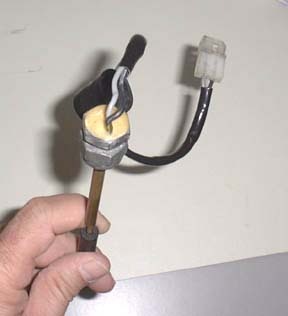 Take one end of the reed switch and insert the thin wire coming out of it coaxially into the stripped part of the auto wire and solder it well. You may also have to solder a shorter piece of the same wire to the other terminal of the reed switch to extend it somewhat. Check Photo 4 to see what the finished assembly should look like.